I am very grateful for the invitation to Hawaii for my one week observership with Dr. Chen. 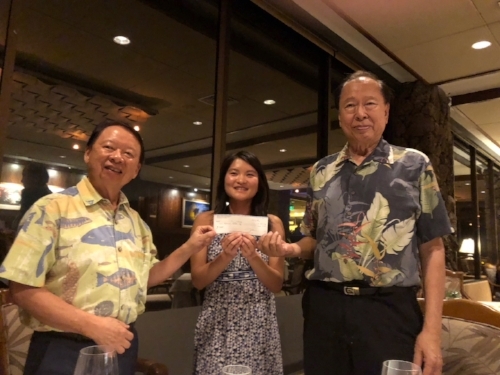 This is my first time to Hawaii and I had a great experience learning more about the practice of ophthalmology in Hawaii from Dr. Chen as well as being immersed in a very culturally diverse island. I highly recommend this experience to other residents as it will encourage you to think critically about your own practice patterns and try innovative techniques in cataract surgery. In clinic, I had a fun time meeting Dr. Chen’s office staff and his patients. Everyone was amazingly warm and welcoming. The majority of patients were being followed for glaucoma, dry eyes and cataracts. My OR experience with Dr. Chen was great as well. He used the LenSx on a few patients for refractive cataract surgery and implanted some premium IOLs with Verion and ORA guidance. His comprehensive surgical skills were on display as he also performs pterygium and eyelid surgeries. Overall, I had a wonderful experience as I got to learn more about ophthalmology medically and surgically as well as try Hawaiian food and learn more about the culture. Most importantly, I appreciated seeing thermocautery for treatment of dry eyes, the use of Verion and ORA for implantation of toric lenses, and seeing how a private practice runs on a daily basis.